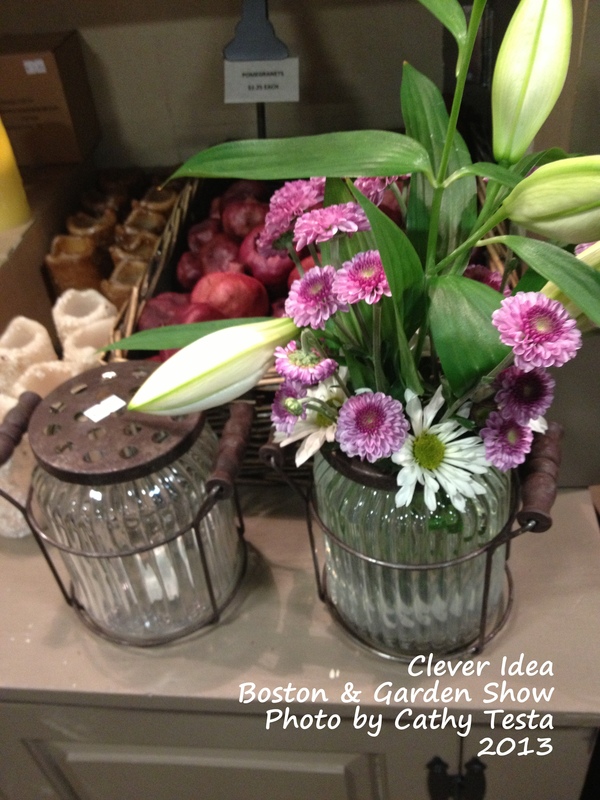 My friend and I both thought these little glass jars, resembling mason jars, with holes drilled in the top cover to insert fresh cut flowers, was very clever. 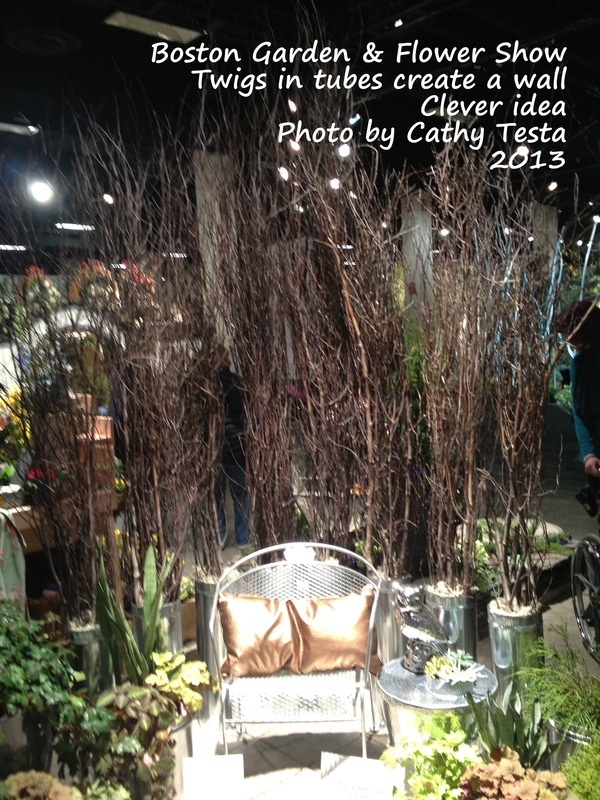 We spotted them at the Boston Garden & Flower Show last weekend. I didn’t buy one, because frankly, I thought, gee, I could make one of these myself – I have tons of old mason jars stocked in my garage, some are made with blue glass. And I know how to use a power drill! The vendor was smart to show how these could be used by displaying an empty jar next to a filled one, otherwise, it may not have popped into your mind. I also thought potpourri could be used in these too. Garden shows are great for providing inspiration and ideas, and you have the option to either buy a handcrafted item, or recreate the idea yourself should you have the skills and time. While I’m at it – Here’s another really clever idea, taking twigs to create a screened in area outside. Look at this next photo. Twigs and sticks were inserted into tall tubes. The tubes were weighted down with rocks. When I saw this at a garden exhibit, I again thought – gee, I could do this myself at home. I tend to stock up on twigs for holiday decor, and there’s always plenty of yard debris from fallen trees. Instead of buying a screen, why not make one like this?! You could use all kinds of bases, maybe even some concrete blocks with the holes in them. Notice in this set-up, the silver of the tubes used were as a decor room theme. The chair and table are silver too, so it works well together. I apologize for not providing the designer’s name to give the credit – I neglected to write it down, but you can find all the garden exhibitors, designers, and vendor names via the show’s website at http://www.bostonflowershow.com.